Callum Hunt has grown up his whole life hearing his father tell him how destructive and dangerous magic really is. So when the test to enter the magic school "Magisterium" comes around, Callum tries his hardest to fail. Instead, he fails to fail and finds himself entering Magisterium. 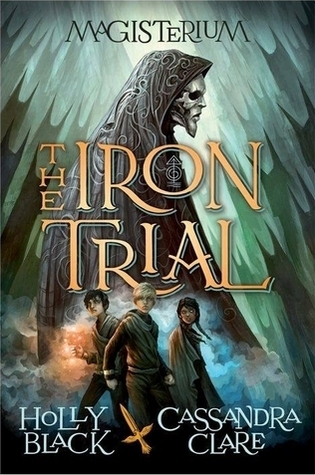 It was hard not to associate The Iron Trial with the ever popular magic series Harry Potter, especially since my brother read it before me and complained "it's exactly like Harry Potter." Still, I gave this a shot and went into it without any biases - or as less as possible. I'm in two minds about this, and I feel like I'm the only one. It was a pretty slow read at the start, and I wasn't sure where it was heading. The prologue did intrigue me but I guess I was reading just to read it. I wasn't fully engaged until Callum entered the school and the world opened up. It was fascinating to read about how magic actually worked and the way the school functioned. Along with that were the characters, who didn't stick immediately but grew on me. I'm not sure I love Callum and his friends just yet, and I found Master Rufus (the main professor) made little impact. Still, it is the first in the series so I'm certain as the series progresses I'll start to like the characters more. Where I think it has its positives and makes it a solid series, is the plot. At first it progressed in a really typical manner, so I sort of floated through it. Then the plot twist hit me right in the face and it really changed my view on the series as a whole. If it's executed correctly, I think Magisterium will work at a whole new level and be a really great series to read. It really questions the rights and wrongs, morality and perceptions in life - adding depth to the plot as well. I do think if you are interested then definitely check it out, because you might enjoy it a lot more than me. I'll give the series a shot for sure, but it didn't carry wow factor for me.